Another great Winter day on the James! I have found it is easier just to post the reports on Facebook. 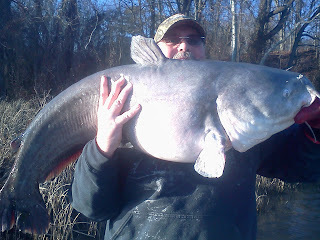 So if you have been wondering what we are catching check out Big Cat Guide Service on Facebook. The spawn will be over soon and we will begin our night time trips ASAP. Give us a call and get your summer trip scheduled. We will be doing trips on the James and Pamunkey rivers. landed while fishing on the Catfish Cadillac on Monday with the heater on board keeping us toasty! "I LET BOB" catch the bigger of the two, after all he is just a master of baits and not a captain ....yet! Actualy Bob landed both fish. He let me hold it. Such a nice guy! This was 41 lbs and both fish bit once and took the pole down. Awesome time of year to land a lunker. 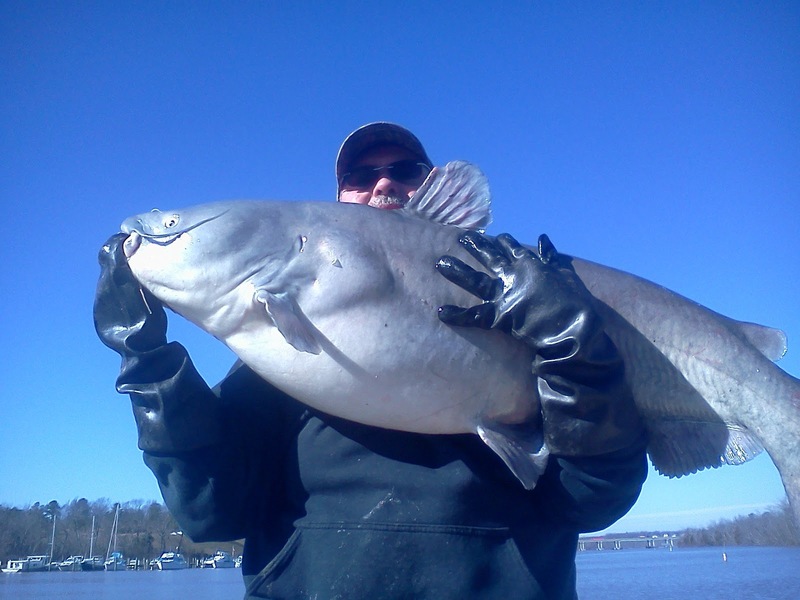 Scott at 804-690-3875 for Pamunkey River and Mattaponi Trips and The Mighty James River for me and my crew. Spend that money ! Went to GreenTop today and did not do too bad. I did buy some awesome looking spoons for the "hickory shad" - Baby Tarpon on the James. If you have never caught one it's gotta be the closest thing to catching tarpon. they swim lightning fast and most times will come out of the water and jump about 1-2 ft in the air in a futile atttempt to spit the hook. Captain Joe - Call today and pick a day in April - Fast ! Capt Joe 804-690-8469 or Capt Scott (804-690-3875) on a 21 foot skiff that flies up and down the river ! The Grand Slam - Stripers, Catfish and Hickories ! Full Day of Action !